We are producing Asagi and Aka Matsuba this season again. Asagi and Akamatsuba are growing in our mud ponds now. and Aka Matsuba this fall. and stabilized the Asagi in the 4th generation. look forward to harvesting Nisai Asagi and Aka Matsuba. 2011.07.25 Monday 18:15 | posted by K. B.
NND Oomo Showa 1st selection 2011 Looking great! Looks like there are going to be many beautiful Oomo Showa again this year. Please watch and enjoy. 2011.07.20 Wednesday 18:33 | posted by K. B.
Kaneko Kujaku 1st selection Looking good!! 2011.07.20 Wednesday 18:27 | posted by K. B.
NND Oomo Showa 1st crop production is under way - spawning for 1st crop production is finished, and "Kuruko" fry are let into 17 mud ponds. In this movie, Fujio Oomo introduces how "kuroko" fry are selected. 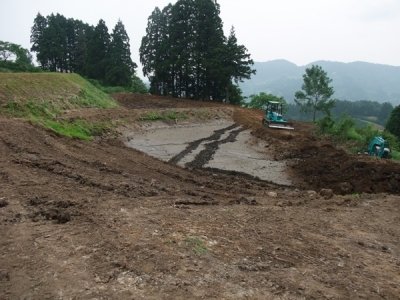 2011.06.25 Saturday 09:20 | posted by K. B.
many of Marusho's beautiful mud ponds are located. cristal clear mountain stream water and rich soil fit for koi pond. And with wonderful views to see. 2011.06.18 Saturday 15:02 | posted by K. B.